Billed as the longest golden teak wood palace in Thailand, the Marukhathaiyawan Palace is a popular tourist attraction in Hua Hin and Cha-Am. It is located between Cha-Am of the Phetchaburi province and Hua Hin of the Prachuap Khiri Khan province, and was built by His Majesty King Vajiravudh Rama VI in 1923, when only few people lived in the province. The Marukhathaiyawan Palace, or the Palace of Love and Hope, wasn’t originally built for summer leisure. 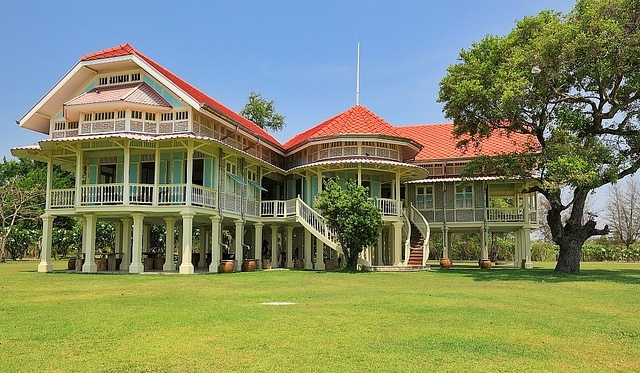 When the King’s health was failing and he decided he wanted to spend his time in a seaside surrounding when his doctor advised a rest, he went to the old Royal summer house at Chao Samran Beach in Phetchaburi. However, the King was not pleased with the Royal residence, so he promptly ordered the construction of another palace near the beach in Huai Sai Nua of the Cha-Am district. The King Rama VI himself made the initial designs of what was to be his summer palace. He wanted his palace to have good ventilation and so he drew a high ceiling. He noted the creation of fret patterns on all the walls, and then made sure there will be plaster walls and concrete pillars. He wanted to build the whole palace on stilts to keep it free from sand. And to keep it free from ants, he thought of having floor recesses that will hold water around the pillars and along the walls connecting to the ground. When he was finished, he consigned the work to an Italian architect Ercole Manfredi, who also worked in the Civil Works Department and who drew the final architectural design. Using the materials from the old summer house and golden teak wood materials, the King’s palace was finished in 1923. It had three groups of buildings. The one-storey buildings were connected by covered wooden corridors, and were held to stand by a total of 1,080 concrete columns. His Majesty then named his new summer palace Mrigadayavan, maintaining the original name of the palace and adopting the name of the park where the Lord Buddha gave his first sermon. From then on, hunting around the area of the Mrigadayavan Palace was forbidden by the King. The Marukhathaiyawan Palace was built as a place for the King Rama VI to recuperate, but sadly he was only able to spend two summers in the palace. He spent the summer of 1924 there after the palace was finished and the summer of 1925 as well before he died in November of the same year. Today, the Marukhathaiyawan Palace is a summer retreat of the Royal family. Facing the sea of the Hua Hin bay, it stands imposing and regal, and is definitely one of the most beautiful places in the province and in Thailand. It is open from 8:00 A.M. to 4:00 P.M. every day. A minimal entrance fee is required to visit the place. Just a few minutes away from the city centers of Hua Hin and Cha-Am, it’s definitely worth your time and visit.